Choose from a wide variety of venues that will inspire and surprise you. 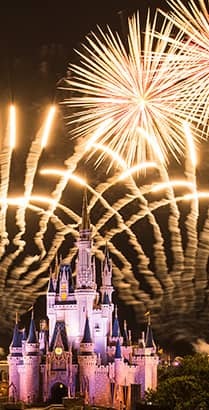 Whether you'd like to make a grand gesture or simply create a magical moment, Walt Disney World Resort in Florida is the perfect place to pop the question. Discover a dazzling array of proposal locations across 4 theme parks, 2 water parks, Disney Springs and uniquely themed Disney Resort hotels. Enhance your proposal with one of many Enchanting Extras—or collaborate with a Disney Engagement Planner to create a proposal that's custom-tailored to complement your style. Elevate your special day with magical experiences, from fireworks to exclusive tours to delectable dining and more. A Disney Engagement Planner will help you create a fairytale engagement that's sure to surprise and delight.